The atomic mass of any substance expressed in grams is the molar mass (MM) of that substance. • The atomic mass of carbon is 12.01 amu per atom. • Therefore, the molar mass of carbon is 12.01 g/mol . • Since nitrogen occurs naturally as a diatomic, N2, the molar mass of nitrogen gas is two times 14.01 g or 28.02 g/mol. 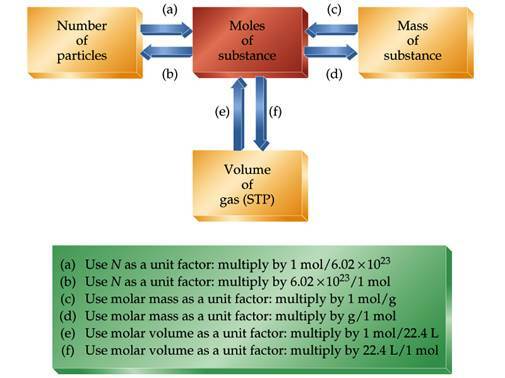 • The molar mass of a substance is the sum of the molar masses of each element. • What is the molar mass of copper(II) nitrite, Cu(NO2)2? • The molar mass for Cu(NO2)2 is 155.57 g/mol. 1. Calculate the molecular mass of Acetic Acid, HC2H3O2. 2. Calculate the formula unit mass of Ammonium Chromate, (NH4)2CrO4 . 3. Calculate the molecular mass of glucose, C6H12O6. This is the only time in the course you will need to use Avogadro's number to relate actual particles to masses and volumes. In the lab we move from masses to mole and never focus on the number of particles. • The mole (mol) is a unit of measure for an amount of a chemical substance (chemist dozen). • A mole is Avogadro’s number of particles, which is 6.02 x 1023 particles. Example B1: How many sodium atoms are in 0.240 mol Na? 1. We want atoms of Na. 2. We have 0.240 mol Na. 3. 1 mole Na = 6.02 x 1023 atoms Na. B1: How many Carbon atoms are contained in 0.01667 moles of Carbon ( 1 carat diamond)? Example B2: How many moles of aluminum are in 3.42 x 1021 atoms Al? 1. We want moles Al. 2. We have 3.42 x 1021 atoms Al. 3. 1 mol Al = 6.02 x 1023 atoms Al. B2: How many moles of Carbon are contained in 3.016 x 1022 atoms of Carbon (3 carat diamond)? We will be using the unit analysis method again. Now we will use the molar mass of a compound to convert between grams of a substance and moles or particles of a substance. If we want to convert particles to mass, we must first convert particles to moles, and then we can convert moles to mass. Example B3: What is the mass of 1.33 moles of titanium, Ti? 2. We have 1.33 moles of titanium. 3. Use the molar mass of Ti: 1 mol Ti = 47.88 g Ti. Example B4: What is the mass of 2.55 x 1023 atoms of lead? 2. We have atoms of lead. 3. Use Avogadro’s number and the molar mass of Pb. Example B5: How many F2 molecules are present in 2.25 g of fluorine gas? 1. We want molecules F2. 2. We have grams F2. 3. Use Avogadro’s number and the molar mass of F2. • What is the mass of a single molecule of sulfur dioxide? The molar mass of SO2 is 64.07 g/mol. • We want mass/molecule SO2, we have the molar mass of sulfur dioxide. The percent composition of a compound lists the mass percent of each element. For example, the percent composition of water, H2O, is 11% hydrogen and 89% oxygen. All water contains 11% hydrogen and 89% oxygen by mass. Assume you have 1 mol of the compound. Next, find the percent composition of water by comparing the masses of hydrogen and oxygen in water to the molar mass of water. TNT (trinitrotoluene) is a white crystalline substance that explodes at 240 °C. 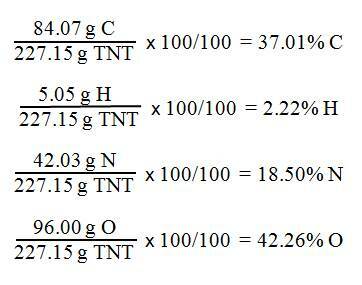 Calculate the percent composition of TNT, C7H5(NO2)3. What is the Empirical Formula? The empirical formula of a compound is the simplest whole number ratio of ions in a formula unit or atoms of each element in a molecule. The molecular formula of benzene is C6H6. - The empirical formula of benzene is CH. The molecular formula of octane is C8H18. We can calculate the empirical formula of a compound from its composition data upon analysis in the lab. We can determine the mole ratio of each element from the mass to determine the empirical formula of radium oxide, Ra?O?. A 1.640 g sample of radium metal was heated to produce 1.755 g of radium oxide. What is the empirical formula? – The molar mass of radium is 226.03 g/mol, and the molar mass of oxygen is 16.00 g/mol. - Simplify the mole ratio by dividing by the smallest number,0.00719 into both 0.00726 and .00719. We can also use percent composition data to calculate empirical formulas. • Assume that you have 100 grams of sample. Acetylene is 92.2% carbon and 7.83% hydrogen. What is the empirical formula? Second: Calculate the moles of each element. Third: The ratio of elements in acetylene is C7.68H7.75. In an experiment 2.410 gram of copper oxide produced 1.925 g of copper metal after heating with oxygen gas. What is the empirical formula of copper oxide?